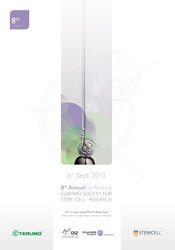 we would like to announce the final program of the 8th annual conference of the GSZ to be held in Rostock, September 6, 2013. The meeting will take place at the centre of Rostock in the congress venue of the Radisson Blue Hotel. We are looking forward to presentations of latest development in stem cell research. The meeting is combined with the 12th Baltic Summeracademy for Cardiac Surgery on September 7, 2013, which is focusing on "Regenerative Medicine in Cardiac Surgery". The two-day program is highly interesting and focuses on presentations by young researchers. The congress fee is valid for both days in the historic hanseatic scenery of Rostock. Download the Programm-Booklet (PDF) for the GSZ 2013 and the Baltic Summeracademy 2013 here. Participation at GSZ 2013 will enable to a free particpation of the Baltic-Summeracademy 2013 as a sequentiell meeting on the saturday, the 7th, held at RadissonBluHotel, Rostock.